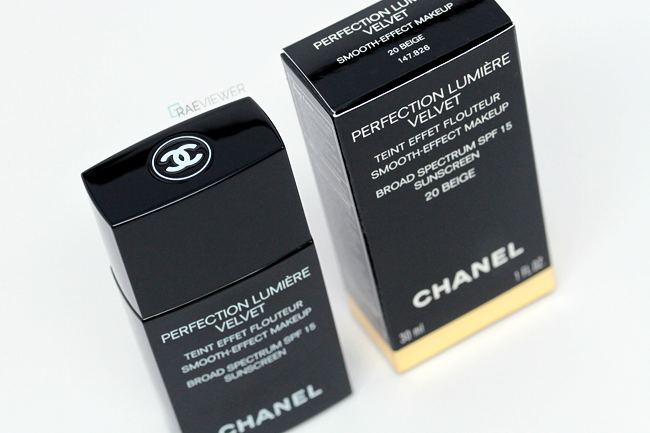 Chanel's Perfection Lumière Velvet ($45 USD) is the newest base makeup release from the brand. It is described as a lightweight, oil-free fluid foundation that provides a long-lasting matte-velvet finish. Its soft-focus pigments are intended to smooth and perfect the complexion for a flawless look that lasts all day. Perfection Lumière Velvet was formulated for those with normal to oily skin, so the launch is perfect timing for sunny Southern California and the upcoming summer. Check out the complete review, foundation comparisons, and swatches after the jump! 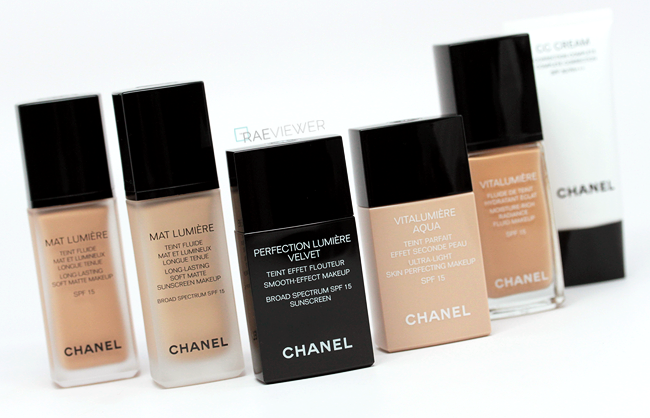 I purchased a bottle in 20 Beige, which is fairly consistent since I currently wear 20 or a mix of 20 and 30 in all other Chanel foundations. Some have reported no oxidization with this foundation, but my blogger buddy @naturalNchicMakeup and I both experienced a significant degree of oxidizing — one full shade up on my bare face. I highly recommend wearing a makeup primer underneath for the most long-lasting, true-to-color wear possible. 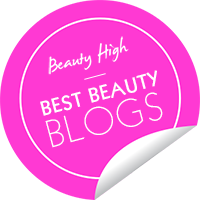 Try the Hourglass Veil Mineral Primer if you have oily skin, the Clarins Instant Light Base in Champagne if you have combination/normal skin, or the Chanel Le Blanc Sheer Illuminating Base if you have dry skin! With primer, the foundation will last up to 10 hours with only a hint of shine on normal skin. The Perfection Lumière Velvet has light to medium coverage and will require concealer on dark spots. I was most impressed by how natural it appeared since it did not drain the life out of my face, and the dry down is feathery soft to the touch. It feels more velvety and less powdery than Perfection Lumière. Although powder is entirely optional, I like to set with Giorgio Armani's Lasting Silk UV Compact Powder in 4 or Koh Gen Doh's Triple Lighting Powder in OC-1 for an extra hour or two of wear. By Terry's Cover-Expert 7 is not quite as warm as Mat Lumière 20, but it is definitely more yellow than Perfection Lumière Velvet in 20. PL Velvet 20 is best categorized as neutral, while Mat Lumière 20 is yellow-warm. Giorgio Armani Maestro in 5.5 and Lumière Aqua in 30 are too dark for me at the moment, but 5.5 is strongly peach while 30 is more orange. 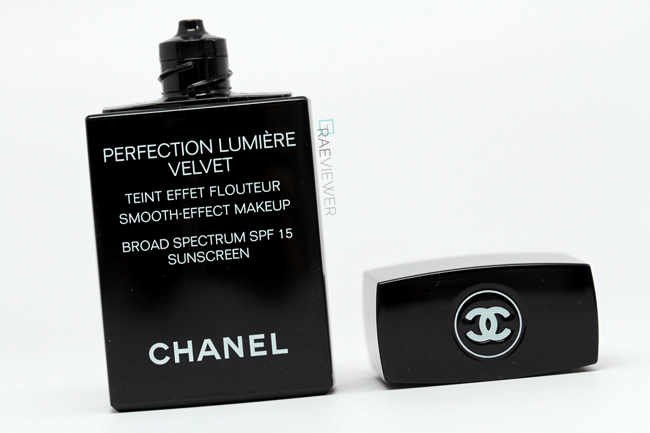 Chanel's Mat Lumière ($54 USD) is officially discontinued now that the PL Velvet has been launched. I purchased a brand new ML bottle in 20 last month so I will enjoy it while it lasts, and then I will purchase Perfection Lumiere in 20 in place of it. Mat Lumiere is nothing like the new Perfection Lumiere Velvet, however, since it has a gently luminous finish that is not powdery in the slightest. When I had combination skin, I abhorred Mat Lumiere. Now that my skin is normal to dry, I absolutely love it and am truly saddened that it has been given the boot. 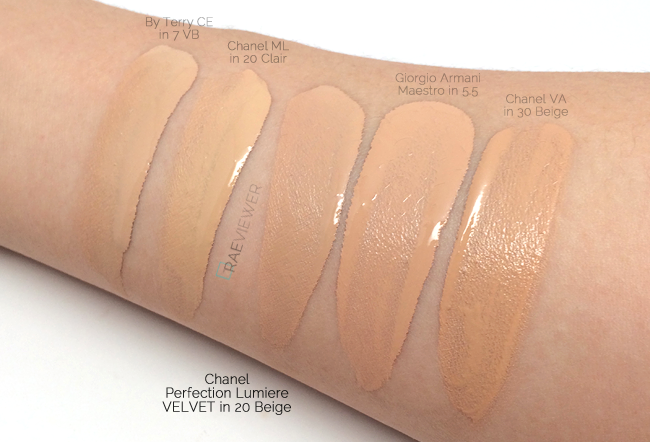 The standard Perfection Lumière ($57 USD) has a thicker, creamier texture and can be built up to medium-full coverage. This foundation dries to a powdery finish and oxidizes at least one shade up on my bare skin. The PL Velvet version is more fluid so it feels more lightweight, and it should only be layered for medium coverage at most. The PLV 30 shade is very similar to PL 30, but the PLV 20 reviewed here is noticeably more pink than PL 20, which is the most yellow-toned shade in the Perfection Lumiere line-up. Chanel's Vitalumière Aqua ($45 USD) is packaged in a plastic squeeze-tube bottle like PL Velvet's, but the VA has sheer coverage and a water-light feel. Since it has a higher water content, it is excellent for combination and oily skin, but this foundation must be shaken thoroughly before use. This is a great range for those who tan, but I find that both B20 and B30 in are slightly more orange-toned than I prefer, especially in comparison to PL or even PLV. Giorgio Armani's Maestro Fusion Foundation ($64 USD) is yet another liquid to powder foundation, but it is not oil-free like the Chanel PL Velvet. Maestro provides sheer to light coverage, clings a little bit more to dry patches, and does not have as much of a soft focus effect on the skin. I love that Maestro feels just like skin, but it is only ideal for normal, freshly exfoliated skin. Combination skin may prefer the PL Velvet. The By Terry Cover-Expert is one of my favorite foundations and is likely the most similar to PL Velvet, as they both have an airy whipped feel as they are blended into the skin. The instant 'fluid to powder' textures create a soft-focus finish, though the Chanel Perfect Lumiere Velvet dries down more powdery while the By Terry appears more matte. Both look the most natural when applied with the fingertips. 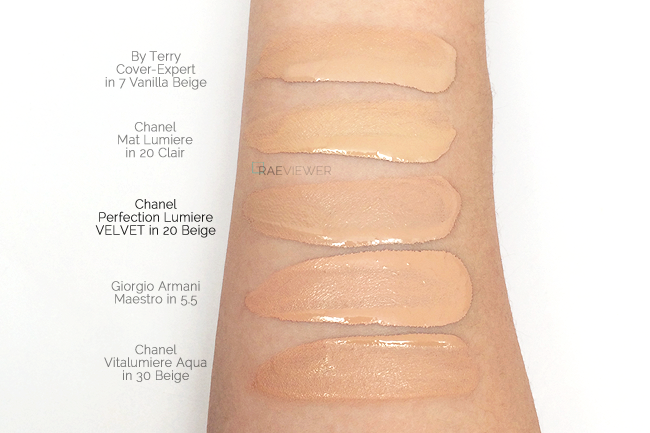 Ultimately, I prefer the Cover-Expert because a primer is not necessary for 9-hour wear, and it does not oxidize. 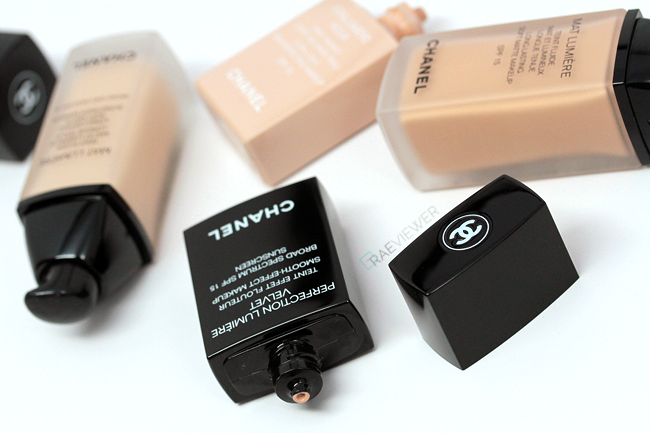 I have always adored Chanel foundations, despite the fact that the majority of them oxidize on me. 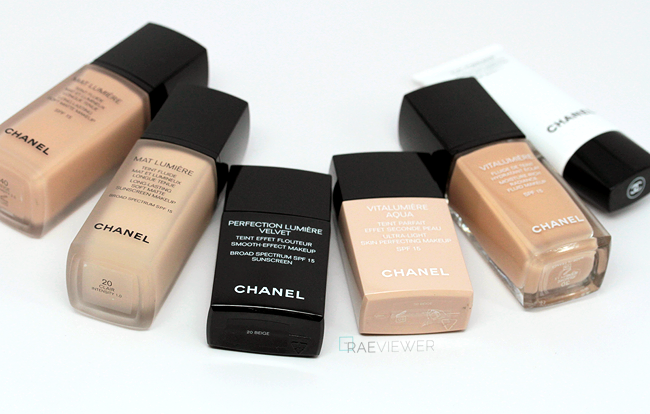 The new Perfection Lumiere Velvet may not be my favorite Chanel foundation since the color range leans more pink than I'd prefer, but it is an exceptional formula for those that enjoy natural coverage. 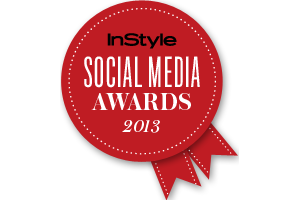 I purchased mine at Nordstrom, but it is also available at Saks and Bloomingdales. 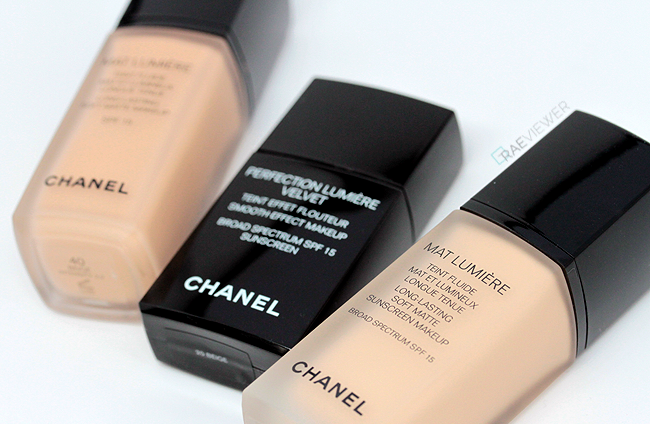 Bottom Line: Chanel Perfection Lumière Velvet is the best Chanel foundation for ALL skin types, so long as the skin is properly prepped and primed.. absolutely worth a try! Thank you Rae <3 I've been waiting for this! Very informative, as usual. Thank you :) It doesn't mention that it is non comedogenic. Have you have any problems with it regarding it irritating sensitive skin? rae, what foundation that is great for normal to oily skin, great coverage, still natural looking and GREAT FOR PHOTOGRAPH? cause every good foundation always has spf in it and it flashes back in flash photography...? 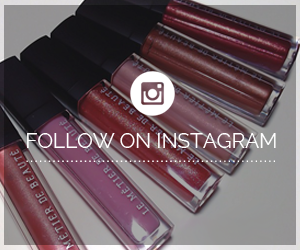 If you could compare this the Estee Lauder's Double Wear Light, which one would you recommend? I'm looking into buying a new long-wear foundation for my oily skin. Thanks! Your reviews are amazing as always! I'm having trouble finding a great foundations with a slight medium to medium coverage.. It's NEVER yellow enough! I think my skin color might be more yellow than yours. I have found one foundation yellow enough with no pink under tone, MAC but I'm not crazy about their foundations. I'm a NC-25 and I have combination to oily skin. 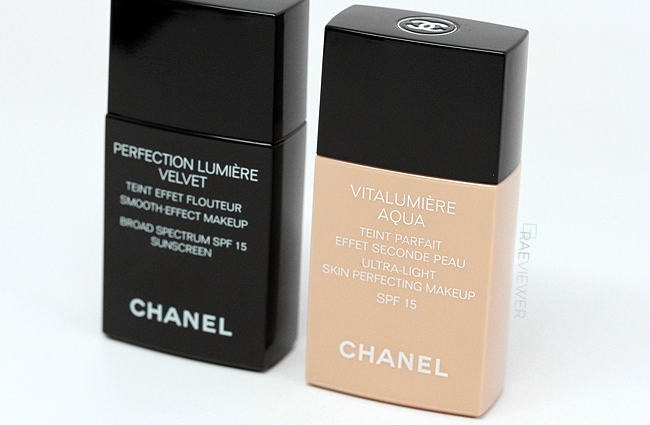 I've tried Guerlian lingerie de peau liquid foundation; It's way too Pink!, Armani Luminous silk; It makes oily my face oily and it's too pink, Chanel perfection lumiere; it's too pink and my face gets oily within 4 hours, Chanel perfection lumiere velvet; it's too pink. I've noticed all the pink undertones when i'm exploded to the sunlight. Could you PLEASE recommend me a few foundations from the price range of 50 - 70ish? I would really appreciate it!